Light and movement. Attach to light string to add a glow to the campfire. The glow will activate a solar cell that powers the movement of Frosty's friends as well as the stick that Frosty is using to roast marshmallows. measures 3 3/4" h. The ornament is a Gold Crown Exclusive. 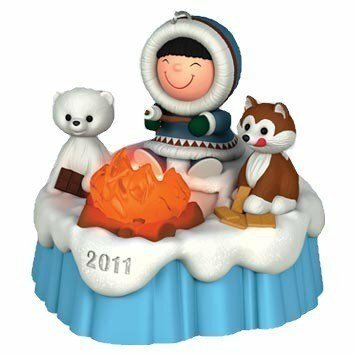 Items Similar To "Hallmark 2011 S'MORE TREATS-FROSTY FRIENDS- Magic Christmas Ornam..."